Convocation of class of 2013, IWSB, a set on Flickr. 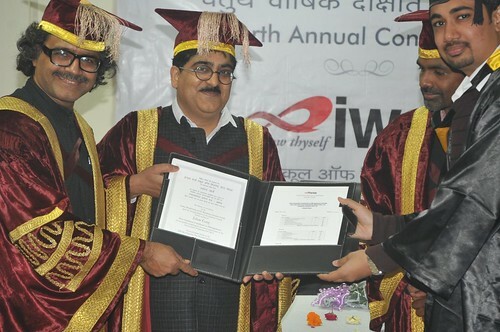 The convocation ceremony, the Ceremonial evening at IWSB, for the class of 2013 was much awaited. Usually the convocation happens before the class joins the corporate world in the month of March. 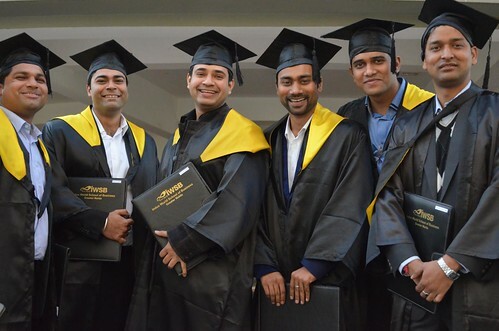 Since this batch did their second year as exchange program students at BIMTECH, the convocation had to be deferred, to receive their grade sheets etc. Prof Navneet, Prof Raju Mazumdar, Prof Sunil Joshi, Prof Bhumika, Prof Rajeev Ranjan along with the families and friends of the class attended the ceremonial evening. a. Have a vision, be passionate about it. Dream Big! c. Believe that the dream has already come true.. He related this with his journey of great self-belief that he always carried since his early college days, of being an entrepreneur. His only aim was to be one and he chased it, tried his hands at a variety of things, with singular aim of being an entrepreneur. The journey took him through various industries and countries, each time a new path emerged, whenever he hit a dead end. Today, Vishwadeep is one of the most celebrated and valued visionary in the Mobile and digital communications industry. Satya, while picking up from what Vishwadeep said, shared that all that Vish said is indeed true; but the most important factor that helps one really succeed in life is – disciplined execution. He reminded the class of 2013 that pay attention to every detail and every small commitment you make. Value every individual and task, irrespective of how big or small. The greatest of the victories on our journeys happen only when we abide by this fundamental value – discipline. With their favourite faculty Navneet and Raju around, who shared a few jovial moments with the batch the evening came to an end. The dream of most of the students, of wearing a ceremonial gown and getting their degrees has been fulfilled. The class had a wonderful time, capturing their selfies and throwing their hats! Wishing each one a great journey ahead. Love you all guys… take care.. The Delhi University announced the first cut-offs for various colleges under it, late last night and was made public this morning by the newspapers. There was joy on many faces, but more faces showed somber mood within. A couple of colleges had 100% as cut-off in the B.Tech computer science courses, while a few stopped short of it by saying 99.75%, a little consolation, for honours courses in Commerce and Economics. Do colleges have any choice? I wonder and so do many, that, how can someone get 100% even in subjective courses like psychology and economics; one can understand in courses like Mathematics and Physics. And the trend is not limited to CBSE, it has been with many state boards too. Wish all these 100%agers bring a few more Noble Prizes for India, on their journey of life. – Delhi University has received over 2.5 Lakh applications this year. Now on an average, every student has applied to 6-8 courses across the colleges… How many distinct applicants really? – Most of the students do not really know what they want to do in life, so hedging across courses. What will the colleges of the university do when students with such high scores apply, and in so many numbers, from across the country? Only possibility is, look at the trend of scores of the students this year, and look at the trend of final choices by the students in the last couple of years for your college, and take out cut-off for each of the courses, hoping such and such numbers would join. If students play games in applying, colleges play with cut-offs. 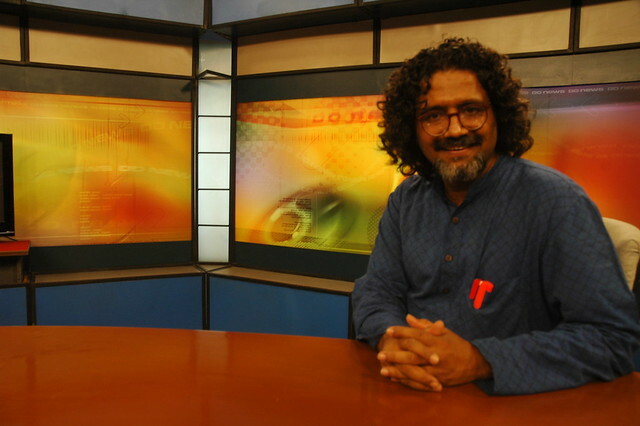 On Doordarshan’s News Night, this evening, we had discussion on the current scenario – Cutt-offs, pressures on students, their parents and family, the choices that they have……. The News Anchor was Gautam and my fellow co-panelists were Prof Pradhyuman, Principal, The Hindu College, DU and two young girls – Amrita, aspiring for the journalism and mass-communication course and Ruchika, an enthusiastic economic honours aspirant. Both Amrita and Ruchika did not make it in the first cut-offs list, but hoping to make it in the next. In the English panel, we had on panel, Mrs Usha Albequerque and the principal of Deen Dayal Upadhyay college of the Delhi university. – Why this flock mentality among students, only for certain courses, and to north campus?